Today I’m thrilled to have Marcus Sheridan on the show. Marcus runs the Sales Lion where he consults and teaches companies how to do inbound content marketing. Today, he’s known as one of the premier thought leaders in the digital sales and marketing space. I’ve been following Marcus for years so it’s cool that we got to connect at Social Media Marketing World for a few minutes and that’s how he ended up here on the podcast. Enjoy the episode! Ahrefs.com – The best all in one SEO tool out there that I personally use to improve my search rankings for my blog and my online store. Click here to win a FREE 3 month membership. GoBrandWin.com – The fastest and most effective way to grow your email list for free using group giveaways. Click here to signup for free. Steve: You’re listening to the My Wife Quit Her Job Podcast, the place where I bring on successful bootstrapped business owners and dig deep into what strategies they use to grow their businesses. Now, today I have Marcus Sheridan from The Sales Lion on the show. And Marcus is an old buddy of mine that started blogging around the same time that I did. He’s definitely one of the better speakers that I’ve ever seen. And today we’re going to talk about inbound content marketing. It’s an incredible episode, and I guarantee that you’ll come away with some actionable nuggets. But before we begin, I want to give a quick shout out to privy who is a sponsor of the show. Privy is the tool that I use to build my email list for both my blog and my online store. And right now I’m using Privy to display a cool wheel of fortune pop up. Basically a user gives their email for a chance to win valuable prices in our store. And customers love the gamification aspect of this. And when I implemented this form email signups increased by 131%. Now, you can also use Privy to reduce cart abandonment with their new cart saver pops and abandoned email sequence as well at one super low price that is much cheaper than using a full blown email marketing solution. So, bottom line, Privy allows me to turn visitors into email subscribers and recover lost sales. So, head on over to Privy.com/Steve and try it for free. And if you decide you need some of the more advanced features, use coupon code MWQHJ for 15% off. Once again, that’s P-R-I-V-Y.com/Steve. Now onto the show. I also want to give a quick shout out to Klaviyo who is also a sponsor of the show. Klaviyo is the tool that I use to build real quality customer relationships with my e-commerce store. And because all my transactions and email correspondence is tracked in Klaviyo, I can easily build meaningful customer relationships by listening, understanding and taking cues from my customers and delivering personalized marketing messages. So for example, with one click of the button, I can easily send a specific and targeted email to all customers with a lifetime value of over 100 bucks who purchased handkerchiefs in the past year. And it is for this reason why over 10,000 brands have switched over to Klaviyo. Right now, they have this cool docuseries called Beyond Black Friday where they discuss successful marketing strategies that their customers are using that you can emulate with your business. So, head on over to Klaviyo.com/beyondbf to check it out. Once again that’s K-L-A-V-I-Y-O.com/beyondbf, now on to the show. Intro: Welcome to the My Wife Quit Her Job Podcast. We will teach you how to create a business that suits your lifestyle so you can spend more time with your family and focus on doing the things that you love. Here’s your host Steve Chou. Steve: Welcome to the My Wife Quit Her Job Podcast. Today I’m thrilled to have Marcus Sheridan on the show. Now if you don’t know who he is, Marcus runs The Sales Lion where he consults and teaches companies how to do inbound content marketing. And today he’s known as one of the premier thought leaders in the digital sales and marketing space. Now, I actually started my blog in 2009 and kind of in my periphery, I’ve been following Marcus for years. So, it’s really cool that we got to finally connect at Social Media Marketing World for just a couple minutes, but that was enough and that’s how he ended up here on today’s podcast. And with that, welcome the show Marcus, how are you doing today man? Marcus: Steve so great to be here man, excited to speak with you and hopefully I’ll say something that your audience says, you know what, that was worth to listen right there. Steve: I got the date correct maybe but you started blogging like 2009? Marcus: Mm-hmm, yeah glorious time man, that’s in internet years, that’s about three decades ago. Steve: We are like dinosaurs I should say. Marcus: You know what? That was actually back when people used to comment on blogs. Steve: Yeah, those are the good old days, exactly yeah. Marcus: That’s a good old inside blog joke there and I love it. Times have changed, man. Times have changed. Steve: I remember at the time, you created the leading swimming pool website on the internet. Can you kind of talk about how you got started with that and how that transitioned over to The Sales Lion? Like what’s your story just for the benefit the readers who don’t know who you are? Marcus: Yeah, I’ll try to give the very short version here. I started swimming pool company out of college with two friends in 2001. Things were going okay for us up until the market crashed in 2008. And by the beginning 2009, I thought we’re going to go out of business and I was getting ready to file for bankruptcy. But that’s when I started to read all these fancy phrases like inbound content marketing, social media blogging, all that stuff. 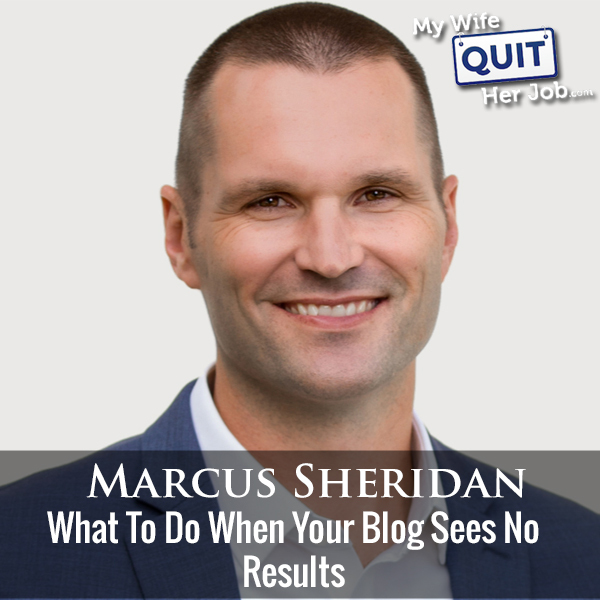 And really what I heard in my simple pulled out mind was, Marcus if you just obsess over your customers questions and you’re willing to address them honestly and transparently through text and video on your website, you just might save your business right? So, I embraced this philosophy that we call, they ask you answer, which basically said, hey, we’re going to be the best teachers in the world when it comes to in our case fiberglass pools. And so, like I said, to make a long story short that’s what we did. We became essentially the web entity of pools, and it became the most traffic swimming pool website in the world in the business, and last year we were the largest installer of fiberglass pools in the US. Now, I’m not a pool guy anymore, I still own a third of the company. But in this process, I started to just to write about what I was doing, which as you mentioned, Steve came at the end of 2009. And so I’m like, you know what, I’m just going to write the stuff that we’re doing, this whole they ask you answer, it’s working and I believe in this. And so, I was just writing about it and then all of a sudden companies said, hey Marcus, can you teach us how to do that? And some conferences said, hey Marcus, can you come share that story of what you do with your pool company in our event, and it just started to snowball from there. And so, I was getting so many requests. I’m like; there is a business model here. And so I transition slowly out of River Pools. And by 2012, I was essentially full on with speaking and consulting. And my agency, The Sales Lion, which is what it was called, is now a part of Impact. I’m one of the owners at Impact and we’ve got about 65 employees, and I give about 70 keynotes a year around the globe on sales, marketing, business communication. It is a dream, my friend, and it’s all because the economy crashed. Like if the economy hadn’t crashed Steve, it wouldn’t have happened, which is amazing how that works. But at the time, I thought it was the most stressful period of my life. Steve: That is crazy. That’s more than one talk a week. Marcus: Yes, yeah. I often, I mean, I’ll generally give that 1.5 talks a week. That’s correct. Marcus: It’s moving. Yeah, moving along. Steve: So Marcus, the reason I wanted to have you on today is to kind of talk about content marketing and how to use it to promote your business. A lot of my listeners are e-commerce sellers, but we don’t have to talk about that per se. But if you can kind of tailor your answers towards an e-commerce biz, that would be pretty cool. Steve: So first off, like if you were running your own e-commerce business, I want to know like, what content works well, how to get results, how would you approach that problem? Marcus: Yeah. So when we started the process of the ask you answer, within about six months, I could see there’s clear patterns of content that works, content that doesn’t work in terms of really moving the needle from a sales perspective, from a search SEO perspective, a whole nine, and we today I call that the Big Five. There’s essentially five subjects that before somebody goes to buy something, they want to understand these five things. It’s the psychological need that we have to feel at ease and to feel informed. And fundamentally today in today’s economy, we don’t want to make a mistake and we know that we don’t have to make mistake but we want to know these five things. So here are the big five. The big five are, as buyers, we are obsessed with how much something costs. Now, we’ll talk more about that, Steve but that doesn’t mean we just put a price. That doesn’t count because every e-commerce person puts a price that doesn’t count as talking about costs. Okay? So we’re obsessed with all my costs and learning about cost as buyers, we are obsessed with understanding the negatives, the problems, the issues, how could this blow up in my face if I purchase it, if I buy it, whatever it is, service, product, it doesn’t matter. Okay, so that’s number two problems. Number three, we’re obsessed with comparisons. In other words, generally, we don’t just look at one thing, we’re looking at two or more of a similar thing, product, service, again, it doesn’t matter. So, we love to compare. Number four, we’re obsessed with what other people say about it, of course, reviews, and then number five obsessed with the best. So generally speaking, we don’t search for the worst. We search for the best, right? These are the big five and here’s what’s fascinating. I’ve seen this again and again and again. When companies obsess over these big five, and they make that their just clear, clear directive, their compass, if you will, that’s what’s going to move the needle, because these five subjects are the bottom of the funnel. And whenever you’re selling a product or a service, especially in the e-commerce space, you want to start at the bottom, not the top of the funnel. The mistake that a lot of people make, if they are producing content, it’s really, really fluffy, right? So let me give you an example if that’s okay Steve. Marcus: And these are going to be pool tables but I don’t want anybody to think because right now if I turn on our e-commerce on our site, I’m sure we do at least a million dollars in revenue just in e-commerce alone because of the traffic that we have. I mean, now some months we’re getting close to a million visitors, I mean we’re doing really, really well. And so, there’s a reason for this, we would kill in this space. But because I’m a manufacturing installer, I don’t elect to go down that road that. So, this is this is an example of how we did with fiberglass pools. Okay, so when I started the process of they ask you answer, one of the first questions that people used to ask me all the time as a support guy was, so Marcus, I’m not going to hold you to it but give me a feel of how much is this going to cost? Of course they might have been talking about a fiberglass swimming pool or an inground swimming pool or whatever. What’s crazy is when we started out this process, nobody in the world had addressed how much does a fiberglass swimming pool costs on their website? The reason for the Steve is because businesses don’t — they’re afraid generally speaking, they’re afraid to talk about, like I’m going to give it away to my competitors, I might scare them away. I mean, there’s all these different things. And so, we openly talked about it and we said, here’s all the factors that are going to drive it up, here’s what could keep it down, here’s the different packages that you can expect, here’s why some companies are expensive and why some companies are cheap. That was critical and fundamental Steve, and this is the part that most ecommerce companies do not do is whenever you sell a product especially if it’s a significant major product within your skew set, you always want to make sure that you have definitive articles and videos just on how much does that particular type of product or service cost. If you don’t do that, you’re never going to play in the search space and you’re going to devalue and potentially commoditize the thing that you’re selling, which is a problem. So, to make a long story Steve, that one article has generated over $6 million in sales, how much does a fiberglass pool cost? Steve: Hold on one second, let’s elaborate on some of the things you just said about cost. I heard you say that you outline what companies do and what they don’t do and what factors into the cost. I was thinking like when you said that that psychologically, customers are going to now ask the competitors whether they do that certain thing and compare that to you. Marcus: Right, that’s correct. That’s correct which is what you want them to do. Just like, let’s say you have an e-commerce platform but you also have a great blog and they mutually feed each other right? So your blog feeds e-commerce, but your e-commerce should be feeding the blog and people are like, what do you mean by — how can — if they’re on the platform, why would the platform feed the blog? Well, if it’s a good platform, you can do things like this, like hypothetically, you could set it up and I guarantee you 99% of your listeners have never done this before. So, let’s say that on your ecommerce platform, you have underneath the price a little arrow with a link that says, see why it costs this much. Now, if a buyer sees a price and then sees a little arrow pointing to a link says, see why cost as much and it’s clickable link that takes them to an article and video that definitively explains why it costs that much. Have you commoditized or decommoditized that thing that you sell? Of course you’ve now decommoditized it. And now you’ve done a major, major value add to that particular visitor. But the problem is, more often than not, in the e-commerce space, it’s just cut and dry. They got reviews. Oftentimes, they do have reviews now on most of these platforms, but they don’t talk about the good, they don’t talk about the bad, they don’t talk about the ugly. Well, they might talk about the good, but they don’t talk about the bad and the ugly enough, and they don’t really explain it well enough. And so, I’m constantly dealing with this. Most of the research I do, especially when I’m shopping ecommerce situations, I have to go and find the prices on the e-commerce platforms, then I have to research on another site that has nothing to do with that particular site to really understand the cost factors like why is this in costing as much as it is, and then I’ll go back to the e-commerce site, that’s dumb. It doesn’t make sense. Of course there’s conversion loss at that point anyway. And so this is why if you really, really do this well and again, if you’re selling a ton of stuff, choose the 20% that are generating 80% of your sales. Focus on that and it’s magical. This is service, product, it doesn’t matter. I’m telling you, for 90% of my clients around the world, I’ve done this with big companies, small companies, 90%, the number of traffic leading sales generating content has to do with cost and price. Steve: This is very interesting. I’m just thinking in my mind, this would be a great place to point out your unique value proposition for each product as well, right? Marcus: Of course, that’s exactly right. That’s exactly right. And this is where you can really blow away transparency because you’re able to say things like, hey, look, this isn’t the most expensive one, and it shouldn’t be, this is for the person that is looking for the middle of the road, but they’re looking for this, this and this, but they’re okay, not getting this, this and that. And if you feel like you are that person, well then, this might be a great fit for you. And it’s certainly a great value for that buyer. Most people don’t communicate like that right? Do you see what I’m saying? It’s just like just flat out here’s what it is, and it’s not this is for you if, this is not for you if. It’s unfortunate that most companies don’t think like that. Steve: I guess my biggest concern here is you’re actually taking them off of the-commerce site to a different article and then they have to make their way back, right? Marcus: Yeah, you open it up in a separate window. And if most of us are paying attention to our conversion rates of those shopping cart pages anyway, it would make us vomit to see how much we lost, right? And so, all you have to do is you split test this out, right? And you can definitively see it. Now, if you have a chance to have it on the actual page, great, have it on the actual page. But the thing is, it’s difficult to do that because most platforms aren’t built that way, right? And you can’t really build out a beautifully robust article slash video interactive format if you do it that way. Steve: I guess now that I’m just thinking about right now, as we’re talking, you could just have a button and it could be like a pop up that is nicely formatted that you can just easily close and still remain on the product page. Marcus: Yeah. So you could do the pop up in the pop up should have, read the full article here if the summation isn’t enough, but you can’t — here’s my philosophy on this Steve, and this is why is this such a big deal to me. We can’t treat people like they’re dumb, we have to treat them like informed humans that are smart shoppers. And so, it’s my strong belief that if we have a choice between let’s not inform them well, allow them to be ignorant and hope that that will increase conversion, or let’s allow them to learn more in the moment, if they’re still not psychologically satisfied with the value prop of that particular product or service knowing that if they do see it upon reading it, it means they’re more serious anyway. And the ones that do say, yep, that’s for me are going to come back and buy. I just refuse to believe that the majority of cases, the person is going to say, wow, my gracious, that was helpful. Okay. Let me go find on some other place now. Steve: Yeah, I think I tend to agree with you. That’s very interesting. Okay. Yeah. Do we have anything more to add on cost before we move on to the next one? Marcus: Not so much on cost? Yeah, I mean, I think that hits the mark on cost. And again, I want to stress this as article in video at this point. We got to be doing it that way. Marcus: So let’s talk about problems for a second. Problems is prolific. Once we feel like all right, I think I want to go down this road, then our natural question is, but how could it blow up in my face? And this is oftentimes why we seek out reviews, but the problem is, if we’re review dependent as an e-commerce shop, or as a business, that’s flawed. We need to beat the punch with these, in other words, get in front of it yourself. Let me get an example, again we’ll go to pools, this applies to everybody, so don’t think you’re different if you listen this because I’m telling you I’ve done this with too many services and products. I know that nobody is the exception to this. And so, what happens is in my case with pools [inaudible 00:18:22] ask me all the time for example, so Marcus what are the problems of fiberglass pools? Very, very common question, and once again Steve nobody in the world, I’m not exaggerating, at the time had addressed that singular question on their site, why? They were afraid to address the elephant right. The smartest companies, they know that the greatest way in life to resolve concern is to address it before it even becomes a concern. And so, I openly talked about the problems of fiberglass pools on our website. And because we talked about it, it’s wild. Every year the number one keyword phrase that generates the most traffic to the site is fiberglass pools problems, or excuse me leads to the site is fiberglass pool problems. So, that article has made a couple million dollars in sales at this point right. And it’s not just there, like when somebody says, hey Marcus; do fiberglass pools pop out of the ground? Okay, I’ll write about that. Are fiberglass pools cheap? Okay, I’ll write about that. These are consistent questions that we would get. So, I’m not going to bury my head in the sand, I’m going to openly address them when we get in front of them and then I can own the conversation set of one of my competitors, so it’s what you want to do. You want to look at your different products and services that you offer, you want to say, on all the times that you’ve been asked, so I heard that, or is it true that, or somebody told me that, or I was reading, when anybody says anything like that, that denotes something negative is coming. And now, if you get on the front end of addressing it, you have a significant chance of earning the person’s trust and respect. But the key is you can’t be biased. Too many people, especially in the e-commerce space are just biased, which loses that trust factor, you can’t become the trust agent at the same time be extremely bias. So, an example of how you might phrase this again, I’ll just go back to the simple pool example. So, we might say something like this, fiberglass pools aren’t for everybody. They don’t get wider than 16 feet, longer than 40 feet, deeper than eight feet; you can’t customize them anywhere you want. So, if you’re looking for a pool that is wider than 16, or longer than 40, or deeper than eight or super customized, it’s probably not a good fit for you. But if you’re looking for a low maintenance pool, that’s going to last year lifetime, has less than 16 my 40, less than 8 feet deep, and you can find a shape that does fit your needs, well then this might be the perfect fit for you. But you notice here, we present the ugly first and then we come back, just psychology, with but this is how it could be a great fit for you if you fit these classifications. So, the idea is when somebody’s going through the process of buying something, the whole time, they’re nodding their head saying, yep, yep, yep. Or they’re shaking their head saying, no, not me, which is fine. Because we don’t want people buying our products anyway, that they’re not a good fit for, not if we have integrity, right? If we sell from a place of integrity, we want people to be very informed about the said product or service so that they don’t make a mistake. So, that doesn’t come back on us or our shop or our product, and they say, these guys never lead me astray. That’s the whole idea. That’s the essence behind problems. Steve: I just want to take a moment to thank Ahrefs for being a sponsor of the show. Now, I’m a huge fan of their tool and in my opinion Ahrefs is the best all in one SEO tool out there to rank in Google search. And recently, I completed a search engine site audit for mywifequitherjob.com and Bumblebeelinens.com and Ahrefs was indispensable. For example, I used Ahrefs to do a deep dive into all my posts to find the highest volume, lowest competition keywords to target in search. And in fact, recently, I used Ahrefs to rank a blog post in Google from position 20 to position five for a big time keyword in the span of just one month by switching around my title and H1 tags. I also use Ahrefs to spy my competitors’ sites to see what keywords they are ranking for, and then I write a more comprehensive post and eventually outrank them in search. Now those of you who know me know that I hate spending money on tools, but I actually pay for Ahrefs and that should say something in itself. Right now, I’m giving away nine three month Ahrefs memberships for free. To sign up, head on over to mywifequitherjob.com/giveaway, once again, that’s mywifequitherjob.com/giveaway to win a three month Ahrefs membership. Now back to the show. I love it. I love it. I know there’s this leather store that does the exact same thing. They point out the flaws in leather and they basically educate you on the different types of leather. And then they show you a demo of their leather, where — it’s called Saddleback Leather, I don’t know if you’ve heard of it, but then they show that they’re leather is basically indestructible, and it’s incredible. Marcus: Yeah, yeah, that’s exactly right. So it what’s funny is, there’s other good leather out there, but they actually understand that unless we show it, it doesn’t exist. I mean, in 2018 and beyond the idea that we would sell anything and just say it and not show it is almost laughable. We have to be in the mindset of unless we show it, it doesn’t exist. They show it really well. It really sticks and it’s crazy. So many other companies could do that, but they don’t. So that’s the essence of problems. You got to get in front of it. Again, the moral of the story is as a business, you have a choice. You can allow your competitors to own those negative conversations or you can own them. That is your call. But clearly one is better than the other. Steve: I love it also because it’s counterintuitive. Marcus: Exactly, a lot of stuff is counterintuitive. And that’s why I’ve given over 200 workshops to different companies around the globe. I’m in New York City right now to give a workshop to sales and marketing team tomorrow basically helping them understand why talking about these things is good instead of burying your head in the sand like most of their competitors and not addressing them, right. Yeah, the problem is, you don’t see many sites doing this well unless it’s like a review site or a third party site. The actual businesses, they don’t generally do it well. Steve: Right. And to find out the problems just use any keyword tool or do a survey, like how do you find out what these problems are? Marcus: Yeah, I mean, hopefully you’re in tuned to what the marketplace is saying, just keyword tool in the world is just listening really well. But beyond that, yes, I would use a keyword tool and search for them. And in that case, I would search for like negative reviews, things like that of the particular product to see what people are saying, and then you can really run with it. But depending on the type of product too, you can just — there’s some standard ones out there, like is XYZ product cheap? I mean that’s like a very legitimate question that a lot of people ask right, that’s a common one that people ask right. How long does XYZ last, an honest review. That’s another example of a really good double up right there. We doubled up on how long does it last which is a problem statement, and then an honest review is review statement, so we doubled them up together and now it’s even more effective. So that’s just a way to do it. Steve: Cool. Let’s move on to number three. Marcus: Number three four versus and versus has picked up finally a lot more. I mean, I was talking about it long before a lot of companies were doing it. It’s still incredibly prolific and important. And as I’m talking about these things, some people are going to listen to this and say, well, I’m just afraid that the marketplace is flooded with all these already and it’s just too saturated for me. That’s a very, very scarce mentality, not healthy for a couple of reasons, A, by you answering these, it forces you to be a dramatically better communicator teacher and force you to know your products better. Also when people come to your site, they’re going to be way, way more informed and they’re going to get your opinion out instead of everybody else’s. This goes on and on for the reasons why we should do it. So, with versus, every product and service generally means that somebody is looking for a comparative item, all right. For me, these poor guys they were looking for fiberglass versus concrete pools, fiberglass versus vinyl pools, and in the swimming pool space, what was funny about that one Steve is no fiberglass pool guy in the world was addressing fiberglass versus concrete pools. Of course the reason was because they were saying our biggest competitor is concrete pools. So, this is where we’re going to do, we’re not going to talk about them on our website and when we will talk about them, well then, nobody will know they exist which is about the stupidest mindset ever. But that’s literally, that’s how so many pool guys thought, right? And so, my mindset was, I’m going to ask this question every day, so you heck yeah, I’m going to address it. So, I openly talked about them. I compared them very honestly; I didn’t say one was better than the other because that would be a lie. And again, it was a matter of hopefully this article is going to help you decide which is the best choice for you and then gave pros and cons of each right. So that’s what we did. Now, what you want to do is you want to think of every comparison based question that you’ve ever been asked. And if you talk with your customers, oftentimes you’re saying things like, so if you were me, which would you choose? Or in e-commerce space this is people that bought this also looked at or also searched for. But the easiest way to do this one is I do like to go to Google and I always just put the product plus the word versus or compared to, and then you get a slew of potential results that you should be talking about, you should be showing and this still works extremely well to this day. But again, the key that most companies screw up man is you just come across as one sided and it just doesn’t work that way. You can’t come out and say, all right, so this video we’re going to explain why fiberglass is really your only choice and concrete frankly is a poor option to consider. That’s dumb, why in the world would people do that? Yet that’s oftentimes the language of companies, that’s not going to induce trust, you got to be real. Steve: This is — I’m just thinking about my own products right now in the digital space, I run a class, which is a pretty high ticket item. It actually makes sense for me to create my own review versus some of the other competitors out there and just point out both my strengths and the weaknesses. I think that would actually help because I know for a fact that a lot of people search for reviews of my class. Marcus: So that’s number four, perfect transition there, Steve. So oftentimes, we leave reviews up to everybody else. I don’t think we should. I think we should also include ourselves in that conversation. Now, there’s different ways that you can do this. You can gather up a lot of the reviews from people that have used it, but you should clearly target that keyword phrase, but here is where we’re going to go even further than that Steve. We should target our competitors’ reviews too. And let me give an example of how I did this incredibly successfully. I’ve made a few million dollars off this. So, I was the first person in the swimming pool industry that in fact in pretty much probably any like home improvement industry because I was teaching this and people are like you’re crazy. In 2009 and 10, I guess I started teaching this, people were like you’re nuts. So let me give an example, because my philosophy was they ask you answer, I was obsessive with listening. And one night, it was probably around 2010 or 11, I had given this — this is at the end of me being a poor guy. And I gave this couple of quote for a pool. And they said, Marcus, we like you. We think we want to do business with you. But if we don’t get this pool from you, is there anybody else that you might recommend? I thought to myself, go on it. You know, I hate this question. And of course, when most companies get asked that question, they’re like, oh, there’s nobody quite like us, the way we do what we do, right? And so yeah, that’s right. And so the person’s is like, oh, whatever. So, I went home that night and as I dug on it, they asked a question so I’m going to answer this. And so, I wrote an article and anybody that’s listening to this, you should look it up, and it was who are the best pool builders in Richmond Virginia, review/ratings. And I came up with a list of five of the best pool builders in Richmond Virginia. Now, come right out and say I didn’t even put myself on the list of five. You might say why did you not? Well first off, if they’re reading the article on my website, they’re already looking around; they’re already thinking I’m a pretty cool guy. The second reason is if you’re going to create a best of lists and then you put yourself on set list, well then, that denotes bias. And again, every business should be built on trust. And so, I’m not going to do something that is going to make me look biased and it’s going to cause me to lose credibility. But the other factor is this, if you go to that, if you just typed in like best pool builders Richmond, Virginia right now, I mean you’d find it immediately in search results, and you’ll see exactly how I wrote it. But I talked about each one of my competitors. Now, here’s what I would suggest on this, you don’t inject opinion, you stick to the facts and you just make clear comparisons, right? So I could clearly compare my competitors in the sense of this is where like this swim pool company has been around since 1972, and they’re located in the mechanics area of Virginia. They specialize in inground vinyl liner swimming pools, and have a heavy emphasis on automatic swimming pool covers. They also install fiberglass pools and have a full service department. Now, all that information I got directly from their website and basically using their words, right. So, I don’t express any negatives. If a company ever does express negative, it should be sourced from an outside article. And even still, I’d be very, very careful, right. I tend not to mix with any of that, I only stick to the facts and I try not to inject opinions when it comes to other people stuff. But because of that, today if you went online and you search for things like reviews, Pla-Mor Pools Richmond Virginia which is a very major competitor of mine in Richmond Virginia, and Pla-Mor is spelled Pla-Mor. So, if you search for reviews Pla-Mor Pools Richmond Virginia which is a very common search, that article is one of the first ones you’re going to see. It’s always one or two in search engine results. And it’s crazy Steve, a few years back I had this lady come to me and she said, Marcus, the craziest thing happened. I was so close to signing a contract with Pla-Mor Pools but before I signed that contract, I decided to go online and research their company. And as I was researching their company, I stumbled across this article that you guys had written. I said my goodness, these guys are honest, so honest, I should probably call them too. And of course Steve, you know what happened because otherwise I wouldn’t be sharing the story right? Marcus: That article cool generated just that year alone $150,000 in sales. And sometimes people say to me, aren’t you afraid you’ve now introduced them to the competition, which is silly because it takes them about point four eight seconds to know who your competitors are. And so, you know and I know that consumer ignorance is no longer a viable sales and marketing strategy right. Now, with the digital age they’re going to find out. And so, if we automatically say to ourselves, look, they’re going to be informed, they’re going to be intelligent, I’m not going to treat them dumb, I’m going to treat them like intelligent human beings with the capacity to learn and understand and make smart decisions. When we do that, it gives us the ability to be way more honest, to say way more, give way more information. I mean, just the possibilities are endless because now there’s nothing handcuffing us, there’s nothing holding us back. It’s very, very exciting and it’s very, very fun. So, I just combined the final two reviews and best into one there but that’s an example of how we did that. And I’m telling you I’ve done that with so many companies to this day. It just wins and it continues to win. I just want to let that tickets for the 2019 Sellers Summit are almost completely sold out. Now, what is the Sellers Summit you ask? It is the conference that I hold every year that specifically targets e-commerce entrepreneurs selling physical products online. And unlike other events that focus on inspirational stories and high level BS, mine is a curriculum based conference where you will leave with practical and actionable strategies specifically for an e-commerce business. Now, recently, I put up the curriculum and the speakers who will be attending and we have an all-star lineup, including Ezra Firestone, Mollie Pittman, Scott Voelker, Greg Mercer, Mike Jackness and more. Now, the Sellers Summit is going to be held in Miami Florida from May 15th to May 17th, and for more information, go to Sellerssummit.com, once again that’s Sellerssummit.com or just Google it. Now back to the show. So, my only concern with what you said was that you don’t include your own company in the top five for example. Steve: The problem is when people do searches; they might not even recognize that they are on your site, and they just look through the straight five and then pick one among your top five and avoid your company all together. Does that happen? Marcus: Yeah, yeah, that could actually happen. And so if I was selling an item with e-commerce, right, an item on e-commerce, I would include in that list, okay. But I would come out — now it’s different with a swimming pool company, right? And you have to read the article to understand why it’s different. It just doesn’t sound the same. Now, I would come out and say, though, now listen, we sell — it would sound something like this, let’s just choose a dumb one, toothbrushes. I would say something like this, here are Marcus’s toothbrushes. We get asked all the time about other brands that we believe are good, and because we believe so much in educating our customers over just having them buy from us, we’ve created this article, this video today that’s going to give you an honest assessment of the top 10 brands that we’ve seen in the marketplace for soft bristle toothbrushes. Now, keep in mind as you read this, two of these we sell. But of course, we sell them because we believe in them so very much. So, although we include them in the top 10, we also include eight others that we don’t sell. And hopefully, this is going to give you a great sense as to what is available in the marketplace and why we chose what we chose. Steve: Interesting, I suppose if it’s something that you don’t sell, you might even be able to establish some sort of affiliate arrangement also. Marcus: You can clearly do this with affiliates. And the other way that you do it Steve is with indirect industries, right? So in other words, let me give you an example. So, if I’m selling swimming pools, I might do something on swimming pool heaters. And the reason why I would want to do that because if they’re looking for a heater, they might also be in the process of buying inground swimming pool and just looking for the heater for a set pool, you see what I’m saying? Marcus: And so, it’s a smart play to indirectly do this. I mean there’s just lots of ways to do this. I mean, I’ve done this with like I’ll give you an example, let’s say and this doesn’t necessarily apply to e-commerce but the same principle. So, let’s say you’re a pet sitter and so you would want to do articles or videos on both always — it’s really always both but on the best veterinarians in your area, because now you’re giving — it’s great credit for them, you’re getting on their radar and people are searching for that, and if they’re looking for a veterinarian, there’s a good chance they need a pet sitter as well. You see what I’m saying? Marcus: So, that cross pollination is really, really effective with best off stuff and it’s still, to this day man, it’s just so effective. Obviously, with any of those, preferably you want to put the year if you can, because it definitely makes a difference in search engine results. Steve: Okay. And then just adjust the year accordingly obviously as time passes. Marcus: Yeah, yeah. I mean because we’re in a, what have you done for me lately world, we just got to keep producing new content isn’t necessarily a bad thing. Steve: Well, let me ask you this, so we’re putting out all this content but it might not necessarily rank anywhere and people might not necessarily be able to find it. And so how do you attack the problem of actually ranking and getting people to read these articles? Marcus: Well, everything we just talked about was a straight SEO play. I mean, it’s very bottom of the funnel based major search. Every single client that I’ve had, in the first year we never get less than 10x growth in terms of traffic. And I don’t even call it SEO, even though that’s essentially what you’re doing because obviously, Google’s obsession is that you specifically and relevantly answer the question better than anybody else. And so, the thing about a lot of e-commerce shops is they don’t produce super quality content oftentimes. For example, I know you know this; the average number one ranked page in SERPs is above 1,000 words, right? And so, whenever we have a client producing a piece of content and we’re vetting it out, unless it’s above 750 or more that’s the — 750 words is the bare minimum acceptable number for any piece of content any of our clients produce, because we help train clients with content marketing okay. So, anything less than that, preferably we like the bar to start at 1,000 words. Now, I’ll be like holy freak, are you serious? Yes. That’s the marketplace, that’s the game we’re in, because meat is good, this is what search engines want. You get all this stuff that like everybody wants short bite sized, not search. Sorry, anyhow works. We want meat and potatoes, man, and that’s why bigger, beefier is better not wasteful. Not wasteful, but bigger, better and beefier is better. Marcus: Yeah, you’re exactly right. You’re exactly right. And I say, 750. That’s the low bar of the low bars. Steve: Yeah. What is your take on the site design as opposed to just the straight content? Like, does the site have to be beautiful? I mean, what is your experience on that, because a lot of people spend a lot of time and money designing a beautiful sight. Marcus: Yeah, and then conversions are less. Steve: Yeah, in e-commerce space, for sure that’s the case yeah. Marcus: Yeah, it’s very, very common and this is because a lot of website designers are arty-farty and there not conversion based. And anybody that’s gone through a website redesign has probably seen that and experienced that which is why we’ve got to be obsessive testers. I mean all of us do. And we never sacrifice — I’m going to put conversions and UX together here because I think done right, great UX leads to conversions. It doesn’t hurt it right? Because to your point earlier, the question about but if you have that Marcus is it going to hurt conversions? I think incredible education increases conversions, right. It’s always been my experience. And so my point is, I think that always needs to be our primary focus and secondary focus is the visual side. That being said, I do think we have to be outrageously obsessive of this point about video. I think most people should see themselves as media companies, pretty much everybody especially on your major products and services. If you don’t have a really robust video that truly says who it’s for and who it’s not for, that’s actually more important, well then, you’re missing the mark in terms of psychology. Steve: So Marcus, we covered a lot of stuff today. And what I want to do is I kind of want to summarize it and kind of put it in a cohesive content plan, so to speak, so that the listeners can come away with something that’s actionable. So, if you want to just give a few actionable tips on how to just get started with what we talked about today, that’d be great. Marcus: So, one of the things that we do that’s been incredibly successful is we have what’s called the content matrix, right? So the content matrix is what you do. Let’s say you’ve got, I don’t know, 20 major products that you sell online or services. So with those 20, let’s create a chart or a graph if you will, and at the top of the chart, you have each one of the major products that you sell. Now, that’s the top of the chart. Now, on the left side of the chart or graph, put the Big Five, put best, cost, problems, versus, reviews, and best. And then take each one of those and fill in all the cost questions that are involved with that particular product, fill in all of the comparison based questions, all the negative based questions, all those things that we’ve talked about. If you do this, and let’s say that you have 10 products that you sell, let’s just use 10, well, it’s not just that you’re going to have 50 pieces of content, you’re probably going to have a couple of hundred pieces of content that come out of it if you’re doing this the right way, right? Because just on versus alone, there’s probably a bunch of versus that you might do, right. And there’s a bunch of cost ones potentially that you might do. I mean, it just depends on how it said. So, the content matrix works and within a couple of hours of just really focus, you’re going to have 12 to 24 months potentially it could be of content to produce through texts, through video that’s very exciting, that’s very, very helpful. I think that’s one of the majors and also urging anybody that this is not a straight e-commerce play but it does matter conjunction with video which is such a big deal. I’ve been doing so much with this with clients and experimenting is crazy. We’ve consistently seen over and over again that putting a video next to a form that people have to fill out a form on your site like on a landing page on average increases conversions around 80 to 90%. But here’s the thing that a lot of companies will mess up is they won’t title video. So they slap a video next to a form, that’s not good enough. What you want to do is the video has a title and the title should be something like this literally, should you fill out this form or see exactly what will happen if you fill out this form. Marcus: It’s really powerful when you have that titled. So the person comes on that landing page or whatever it is, and you’re trying to get their information for whatever reason, and they have a form. There’s four major fears that people have when they fill out forms. Number one, are you going to call me to death if you’re asking for my number? Number two, are you going to spam me to death if you’re asking for my email? Number three, what are you going to do with my information, privacy. Then number four, exactly what is this process going to look like if I fill out this form? So you want to address all for those fears in this video. You do it nice and easy and relax, right? So, it’d literally be something like this. I might say okay, so you’re sitting there right now and you’re saying to yourself, should I fill out this form really, are you going to spam me? Are you going to like email me or call me to death? All right, let’s talk about exactly what this is going to look like. So then you explain it. At the end of the video, it doesn’t have to be long at all. At the end of the video you say, so hopefully that addresses your concerns. If any questions let us know. Otherwise, fill out the form; we can’t wait to talk with you soon. Unbelievable results, generally like I said, 80, 90%. I’ve seen a bunch that were between 150, 200% lead to conversions. So those are magical. You see very, very few companies doing that right now, it’s a major opportunity Steve. Steve: Would you suggest doing this on like an e-commerce checkout page though? Marcus: Absolutely, absolutely all stinking day long. And again, the beauty behind this guys, is we can split test this stuff, so you don’t want to take my word for it. If you doubt it, split it and you know what, oh yeah, the poor guy was right. At least test it because I’m happy to — there might be situations where it’s more effective 90% of the time, but 10% it’s not. That’s okay; let’s use it for the 90. Steve: So, just to kind of reiterate what you said, so in the checkout process, you want to just kind of outline the forms that you will experience, what the outcome is going to be, and reassure them that you’re not going to sell their information and that sort of thing. Marcus: That’s right, overcome those four major fears, major conversion list buddy. Steve: Interesting. Okay, I’ve never thought to do that at all. Marcus: That’s why we’re talking. Steve: I know, so what else you got Marcus. Marcus: I got lots of stuff. Steve: We got five minutes left or whatever. If you got anything else, that’d be great. These have been awesome nuggets. Marcus: Yeah. Well, and hopefully it means to the listeners, look, if you get the book they ask you answer, it’s on Amazon, Barnes & Noble, all the stuff. It was rated the number one marketing book in 2017 by Mashable. And it really breaks all the big five down and talks about this really, really well, all the principles definitively apply to e-commerce. I mean, it really, really does. One thing that I would suggest to people to consider doing Steve, if you are not using some of these simple personalized email video marketing tools by now, you are behind the eye ball, for customer service and e-commerce, they are unfricking believable. So, an example of these tools would be GoVideo by Vidyard or Soapbox by Wistia or there’s some others out there. And many people when a purchase is made, they’ll send some automated, hey, thank you. But even better especially if they spend a bunch of money with you, if you create a quick personalized video that says, hey Steve, you just went on our site and you purchased this, man, I’m so excited for you, I just want to thank you. But if you do that, and they see the thumbnail of you holding up a card that says, thank you Steve for your purchase, and it comes to them the same day, they’re going to be blown away. This is stuff that Amazon isn’t doing yet. And that is the power of personalized video; it’s free. If you get GoVideo right now by Vidyard is the company that makes it, it’s a free Chrome extension and anybody that is not technical can learn how to do in about 60 seconds. Everybody that’s listening to us right now for that ultra, powerful customer service experience should be sending out personalized email videos. And it makes all the difference. Steve: And so just to be clear, this service, so I’m not familiar with the service, you can actually personalize a video and generate on the fly? Marcus: Super, super fast. So, it’s like if I wanted to Steve, and I might even do it after we get off this, I might just send it to you directly just because it is amazing. There’s two major problems with emails that we have. Okay, number one, do they open it? Number two, do they consume it after it’s been opened? So those are the two major problems, so how do you do it? You got a subject line that says something like this. Hey Steve, I made this video for you. Okay. Now as soon as you see that, you have to open it, psychologically you don’t have a choice, right? You don’t have a choice. Then when you see a thumbnail of a video and on that video I’ve got this little whiteboard or note that’s saying, hey Steve, I just wanted to thank you, whatever, hey Steve, or whatever it says, or just Steve exclamation point. Once again, you can’t help but to click on the video and watch it. And the whole thing oftentimes will take me less time than actually writing out an email, and it’s so outrageously personalized and it’s just different than what anybody else is doing. Again, GoVideo by Vidyard, it’s free Chrome extension guys; get it right now unless you’re using some other type of personalized video program. Steve: I love it Marcus. Hey, I want to give you a chance to talk about your services and your books and all the other services that you have to offer. Marcus: Yeah, well, I’ve got an agency; it’s called Impact Brand and Design, ImpactBnD, Bravo and Nancy, Impactbnd.com is my agency, but my personal site is Marcussheridan.com. And I speak all over the world and if you’ve got — I know there’s a lot of solopreneurs here that don’t necessarily need a workshop, but if you’re thinking about somebody for a conference or whatever, recommend me because this is what I do and I have a lot of fun with it. And my obsession is the audience and their takeaways, and hopefully, that’s what this audience has gotten today Steve. They’re like, man, that’s a clear nugget. That’s a clear nugget. That’s a clear nugget, not a bunch of fluff, not a bunch of hypothetical jargon. They’re like man, this is actionable and I can take it and apply it to my business tomorrow. That’s always my goal. Steve: Absolutely. In fact, Marcus I may not publish this episode and keep all these nuggets to myself. Steve: But thanks a lot for coming on the show Marcus, really appreciate your time. I hope you enjoyed that episode. Marcus is amazing at planning and writing copy that converts and I know that I’m personally going to listen to this episode one more time in case I missed anything. For more information about this episode, go to mywifequitherjob.com/episode243. And once again, I want to thank Klaviyo for sponsoring this episode. Klaviyo is my email marketing platform of choice for developing real quality customer relationships. Right now they just released a cool docuseries called Beyond Black Friday where you can learn successful e-commerce marketing strategies from real companies using their platform. This docuseries is free and you check it out at Klaviyo.com/beyondbf, once again that’s K-L-A-V-I-Y-O.com/beyondbf. I also want to thank Privy for sponsoring this episode. Privy is the email capture provider that I personally use to turn visitors into email subscribers. They offer email capture, exit intent, and site targeting tools to make it super simple as well. And I like Privy because it’s so powerful and you can basically trigger custom pop-ups for any primer that is closely tied to your ecommerce store. If you want to give it a try, it is free. So, head on over to Privy.com/Steve, once again, that’s P-R-I-V-Y.com/Steve. Dude, that podcast with Marcus Sheridan was sooo good! I’ve never stopped what I’m doing to take notes from a podcast before but there was so much good stuff in there. In the past I’ve paid for less knowledge that I got in that 53 minutes. Great Job! GoVideo by Vidyard is a SIMPLE Screen recorder. How can it be used to automate creation of personalized thank you videos?